Our 100% compatible QuickBooks Invoice Forms grab attention and commands on-time payment. Give your business a Fortune 100 company look. Set yourself apart from the 20 million other businesses that use QuickBooks Invoice forms. When you order these high-quality forms you get the QuickBooks template to import with easy instructions with your order free. We provide everything you need. Choice of blank Blue, Green, Burgundy, or Cream invoice form with white 3″ perforated payment voucher. Printed QuickBooks Invoice form will fit standard #10 double window envelopes for mailing to your customer. QuickBooks Invoice form is retained by the customer. Payment Voucher fits standard #10 double window envelopes or standard double window check envelopes for your customers’ convenience. Just load this specially designed BLANK QuickBooks invoice form into your printer and QuickBooks will print all descriptions, graphics, and amounts on the form. 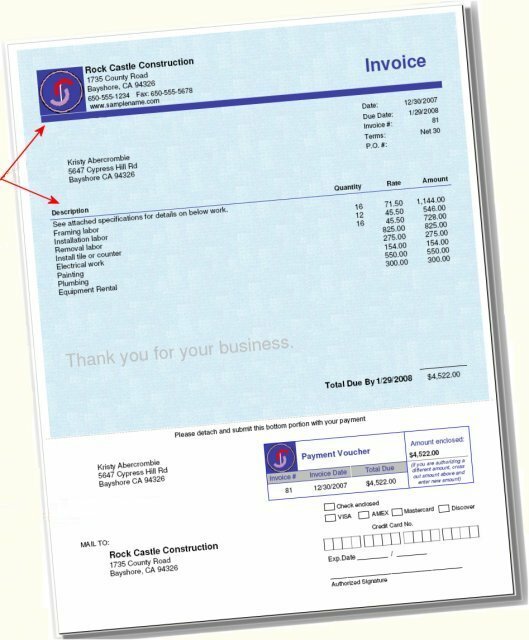 The result is a professional invoice sheet on color paper with a perforated white payment voucher. Free shipping on your first order – REMINDER – YOU MUST CALL IN YOUR ORDER!! Two pre-formatted QuickBooks Invoice Templates ( .DES File compatible with QuickBooks 2018, 2017, 2016, 2015, 2014, 2013, 2012, 2011, 2010, 2009, 2008, 2007, 2006) with instructions on how to add your logo. One template includes color fonts the other is a grey scale for black ink printers. For color graphics (fonts, borders, logos) you must use a color inkjet or color laser printer. Easily customize the QuickBooks template we send you FREE with your order. Add your logo, font colors, and graphics. Quickly remove graphics and text that may not apply such as credit card information. We provide easy set-up instructions. Standard #10 mailing envelopes for this invoice form are available for purchase from your local stationary store.